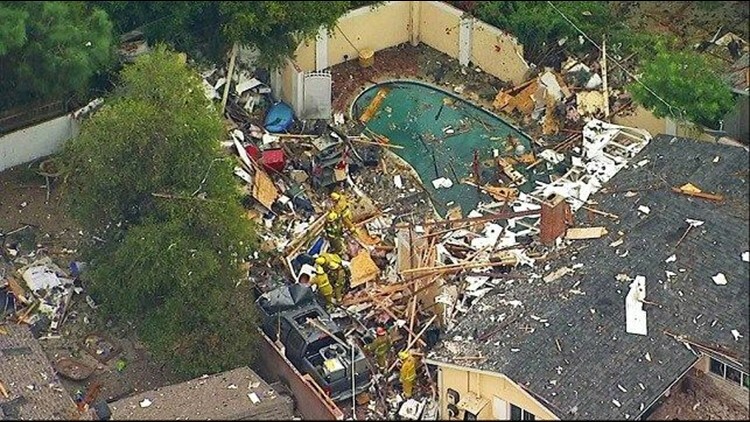 WEST HILLS (CNS) - An explosion destroyed a garage in West Hills Thursday, damaging homes but injuring no one, and while police said illegal drug production or other illicit activity wasn't involved the cause was not immediately determined. Images from the scene showed splintered lumber, roof shingles and other debris scattered in the rear of a single-family home in the 7500 block of Sale Avenue, near Saticoy Street. Wreckage was also scattered in the yard and on the roof of an adjacent home and a piece was even lodged high in a nearby tree. Five homes sustained damage, according to a report from the scene and police later reported that building inspectors red-tagged three homes, meaning they were deemed unsafe to enter. The blast was reported just after 3 p.m., according to Margaret Stewart of the Los Angeles Fire Department. Firefighters were seen evaluating two children at the scene, but Stewart said no one was injured and no one was taken to a hospital. Crews worked to make certain all utilities were shut off and the Southern California Gas Co., which responded to the scene, reported there were no gas appliances in the garage. Police investigated if illegal drug production was involved, but ultimately ruled out that possibility. Gas company spokeswoman Melissa Bailey said the utility was "assisting local authorities as the investigation continues."